I had an unexpected trip to the children’s hospital today, which is a two hour drive one way. Our littlest had surgery earlier this week and the dressing had come lose, so the doctor wanted us to come back. The wonderful news is that he fixed the dressing and everything looks great and is healing well. Yay for happy endings to sudden stress! Now that’s enough about me. Because, hey, what I really want is to thank each of you. A huge thank you to everyone who left a comment on our last month of Thanksgiving Blog Candy Giveaway. I loved hearing from each of you about your favorite way to embellish a card. 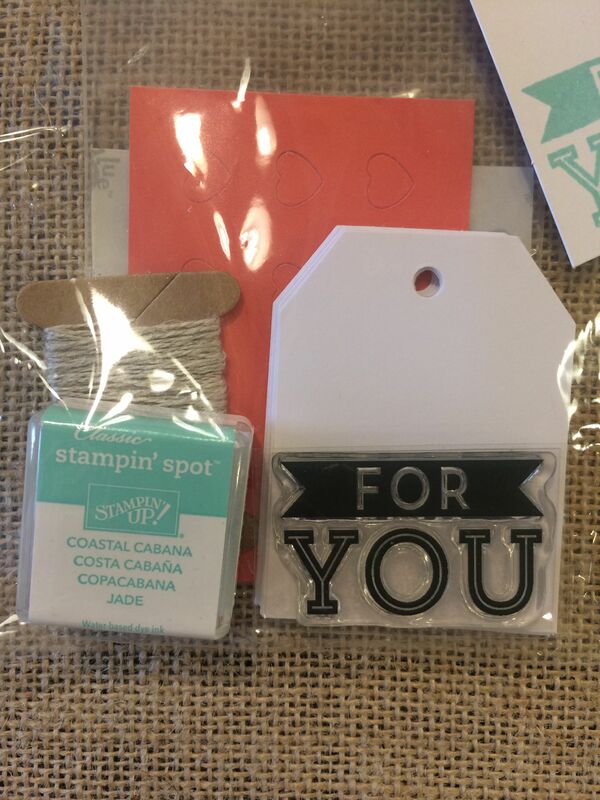 Rosalie, email your address to stampin365@gmail.com and I will send these goodies out to you! Congrats again and happy stampin’! 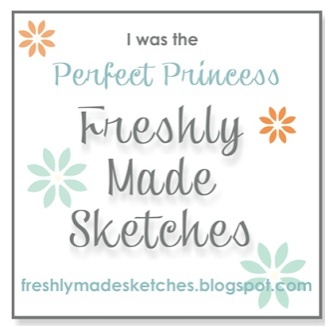 Posted in Giveaway	Tagged Blog Candy, Free Stampin' Up! It’s time for our final month of Thanksgiving Blog Candy Giveaway! 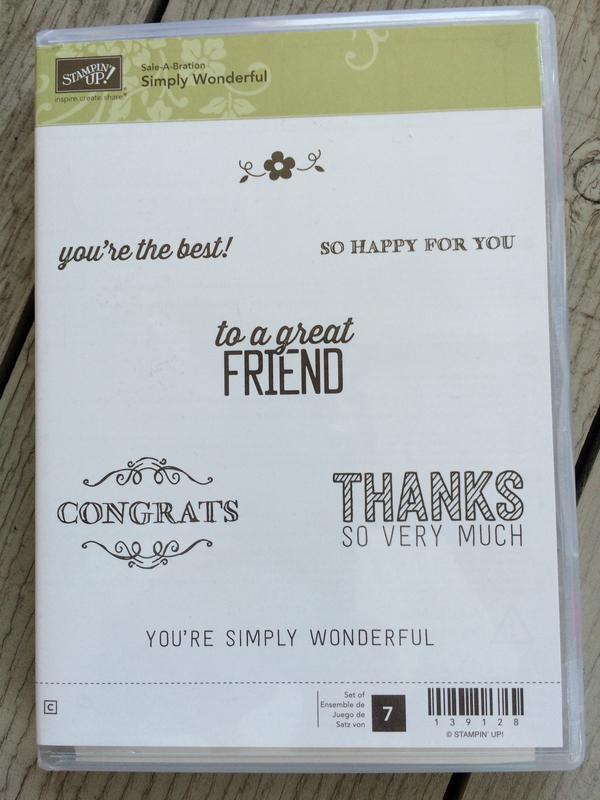 One lucky winner will receive this brand new Stampin’ Up! 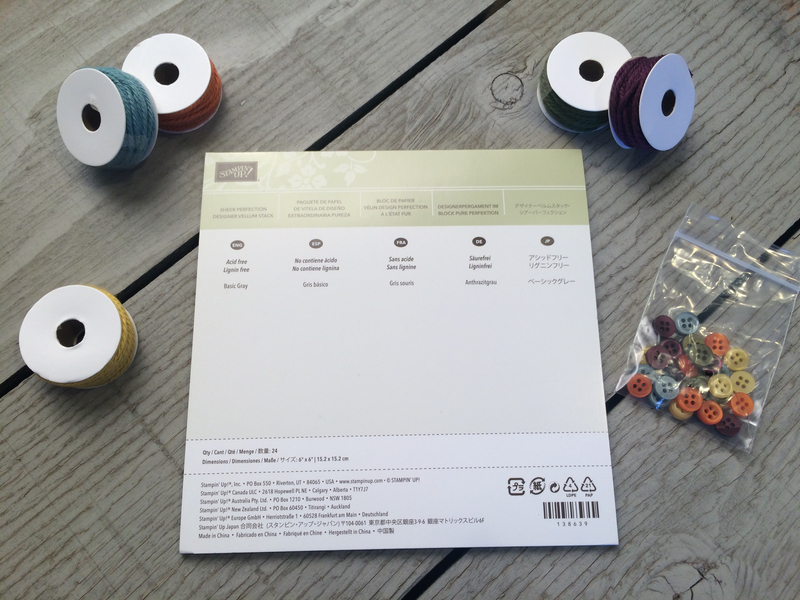 stamp set called “You Brighten My Day” along with six designer buttons, hello honey cotton ribbon and 12 sheets of 6×6 designer series paper. Would you like a chance to win? 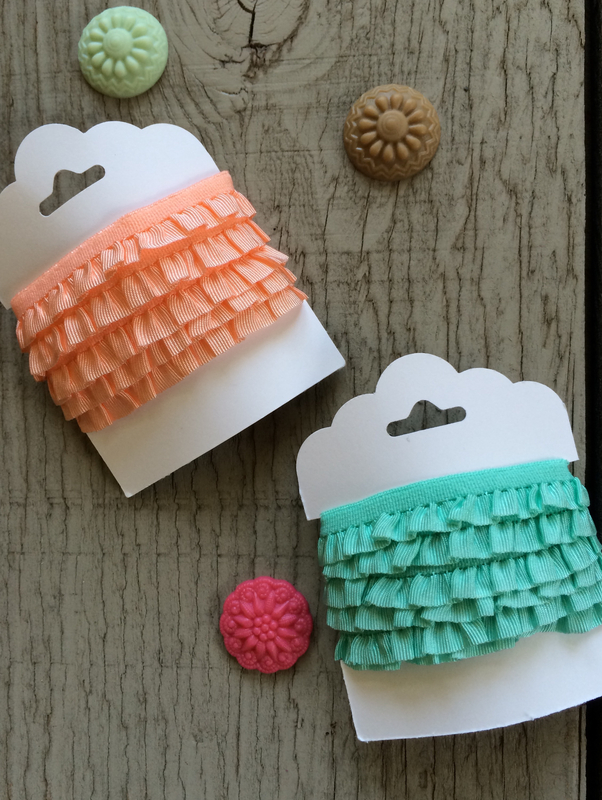 Leave a comment on this post with your favorite accessory to add to your craft projects. Whether you love buttons, ribbon or a little bling, I want to know! I will randomly select a name from all of the comments and announce the winner on Friday, December 4th. Best wishes and happy stampin’ friends! P.S. Be sure to check out these amazing clearance rack items! Posted in Giveaway, Uncategorized	Tagged Blog Candy Giveaway, Stampin' Up! How About More Blog Candy? 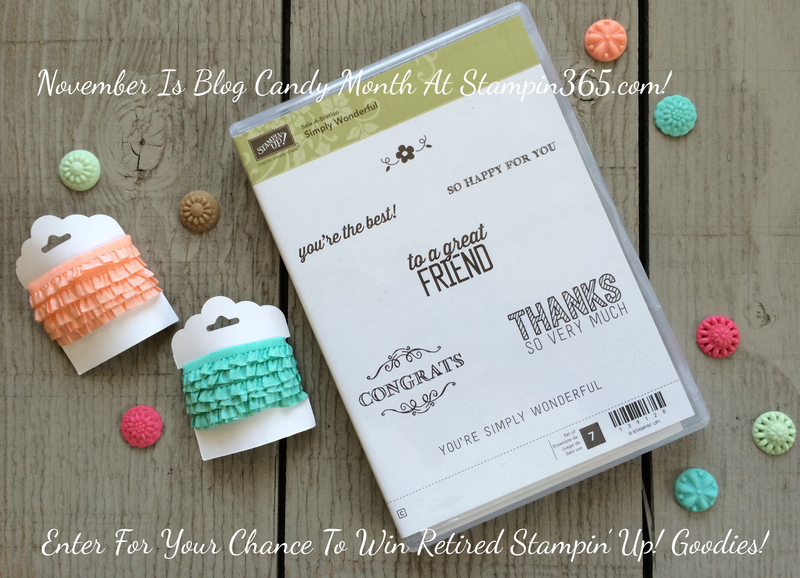 Well., it’s week three of our Blog Candy Giveaway here at Stampin365- are you ready to play along? It’s easy! 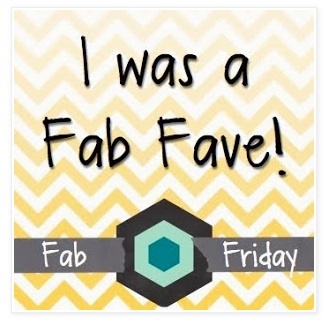 All you need to do is leave a comment on this post telling us your favorite ever Stampin’ Up! stamp set. O.K, O.K., maybe that’s actually really hard. If you’re like me, they’re ALL your favorites! But I know you can do it! Isn’t that a fun set? I’ll do a random drawing from all the comments and announce the winner on Thursday, November, 26th. P.S. If you haven’t already, be sure to click the follow button so you won’t miss when I announce the winner! Posted in Giveaway	Tagged Blog Candy Giveaway, Stampin' Up! Well, I promised some blog candy and here it is! I am so thankful for each of you, so during this month of Thanksgiving, I plan to give away some brand new, retired Stamping’ Up! goodies every Friday. Simply leave me a comment on this post telling me your favorite Stampin’ Up! color(s). I will randomly choose a name from all the comments and post the winner on Thursday, November 12th. Good Luck and Happy Stampin’! 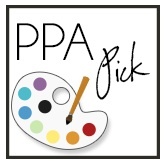 Be sure to follow my blog so you won’t miss when I announce the winner! 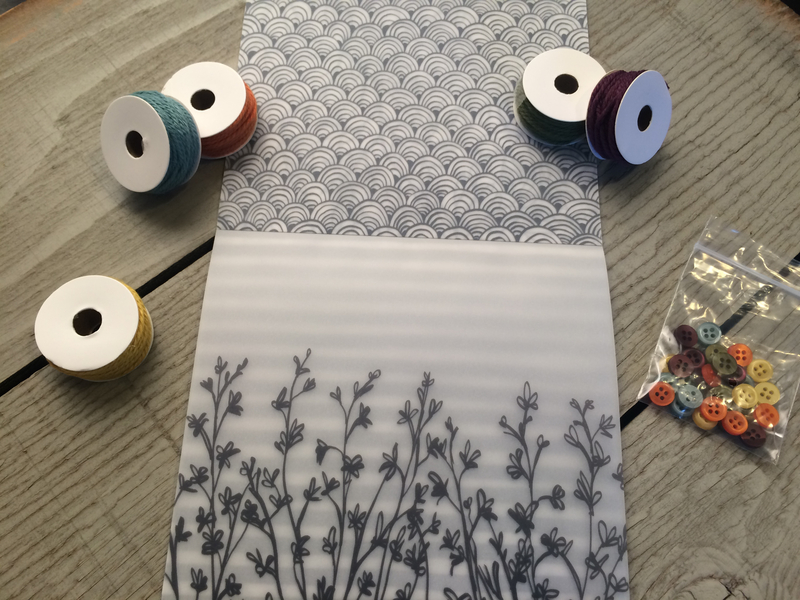 The winner for our November Blog Love- Week 5 Giveaway is Ardie! Thank you to all who entered. It was so fun to send off the prizes and read all the comments. Each one of you is wonderful gift and I wish I could send something to all of you! 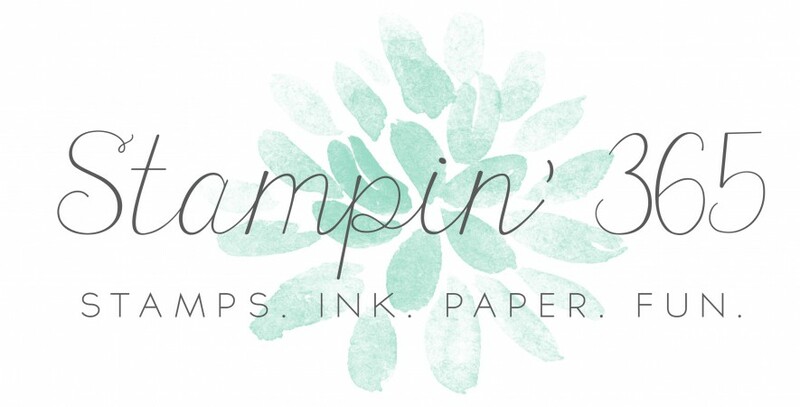 Don’t forget the fabulous deals available from Stampin’ Up! There are still two days left. Click on the link below to see the bargains with savings up to 50% off. More details on this limited-time offer are listed below. Can’t wait to get in on the fun? Get started here . All orders must be finalized in the month of December to qualify for the five percent cash back offer. A demonstrator must remain active to receive the five percent cash back. The five percent cash back will be awarded in January. Mail: All Starter Kit orders must be received by the end of the business day on December 2 . Online: All Starter Kit orders must be finalized on December 2 by 11:50 PM (MT). Posted in Giveaway, Promotions	Tagged Join Stampin' Up!, Stampin' Up! November isn’t over, so I have one last giveaway to show my appreciation to all of you! This cute little kit was so fun to create, using leftover Paper Pumpkin supplies. 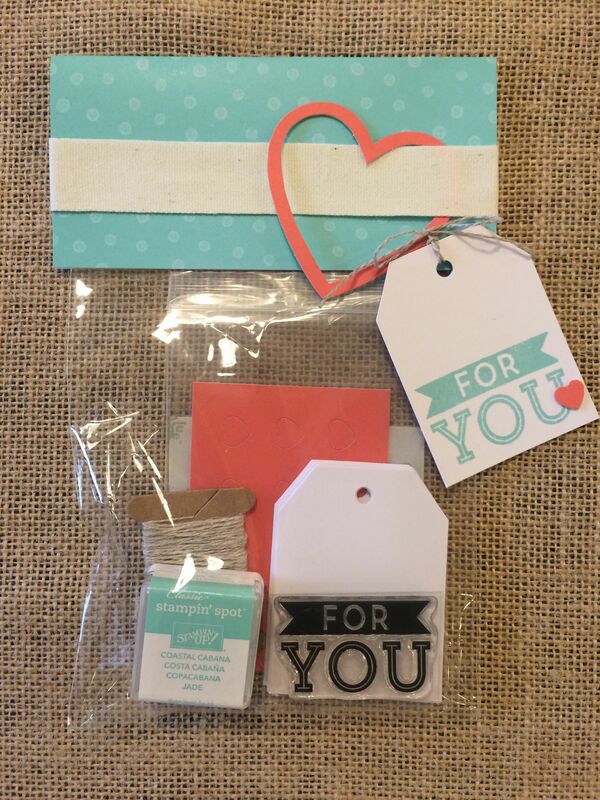 It has everything you need to make 10 gift tags and includes 10 pre-cut tags, an exclusive photopolymer stamp, twine, a mini Coastal Cabana ink pad, self adhesive hearts and glue dots, all in this gift package. I love paper Pumpkin because there are always leftover supplies to create extra projects like this one. Would you like to enter to win? Leave me a comment on this post by noon (Pacific Standard Time) on Sunday, November 30th. I will randomly select someone and post the lucky winner on Sunday, November 30th. Good luck to all of you and happy stampin’ friends!